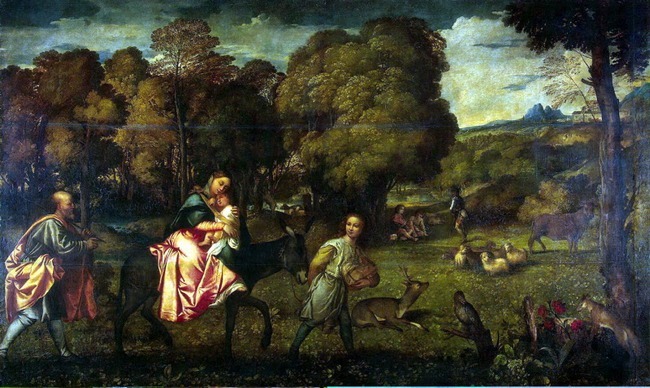 Today’s article is devoted to the outstanding and brilliant artists of the late Renaissance Giorgione Titian Vecellio. 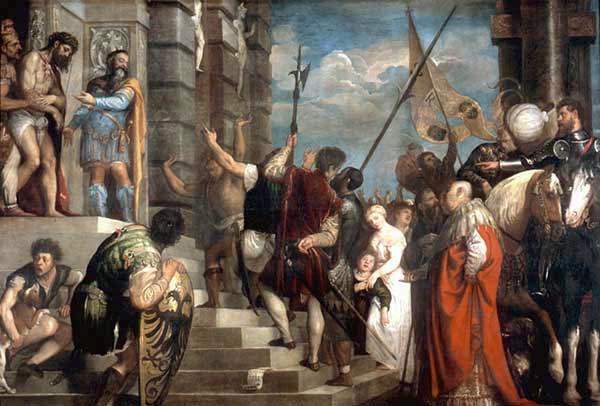 Not as well known as his Florentine colleague, however, the artistic legacy of Titian’s incredible huge and brilliant. 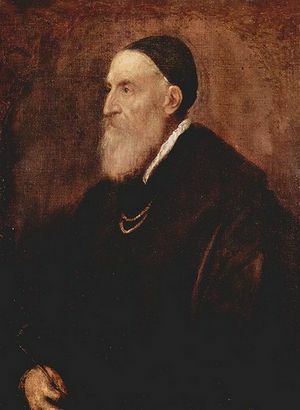 Titian himself lived and worked in the beautiful city of Venice, which is constantly competed with Florence in political, economic and cultural terms. If Florence has given the world such titans of world art like Leonardo da Vinci, Michelangelo, Raphael, Botticelli, it gave birth to the beautiful Venice by Titian, which deservedly considered the best painter of the Venetian Republic. Born Giorgione Titian Vecellio (1477-1576) is not in Venice, and in the small town of Pieve de Kodori in the north of Italy, in a mountainous area near the Alps. As you can see, the artist lived for a surprisingly long time (and productive) life – almost a century. Already in his youth the young Titian moved to Venice, where he trained in the art studio of Giovanni Bellini. In his works the artist tries to cover many diverse motives and genres of painting. In his paintings, the scene of triumphant joy alternate with scenes of tragic religious motifs – with mythological subjects. Especially strongly inspired by the artist’s images of beautiful female beauty. And quite often in his paintings you can admire the marvelous beauty of the naked female body. For example, in this one of its earliest of the pictures. It’s called “Love the earth and heaven.” Love the earth is represented as a naked woman on the left in a red cape. Red ulterior motive, because red symbolizes passion. Passion, sexuality, eroticism just are the main manifestations of earthly love. But the right-hand side of the picture sits heavenly love chaste as a beautiful lady dressed in white, and between them in the middle you can see a small Amurchik who put his pen into the well, on which sit the two beautiful young ladies. Amurchik also an ulterior motive is closer to the celestial chaste love – real, true love. And this is another famous painting of the artist – “Venus of Urbino”. He wrote on the order of a rich duke of Urbino (Urbino, and why). In the picture, the beautiful goddess of love Venus dreamy lying on a feather bed. At the foot of a dog sleeping peacefully, while in the background two maids take out clothes from a huge trunk. I wonder how many would have cost to buy a painting from such masters as Titian? 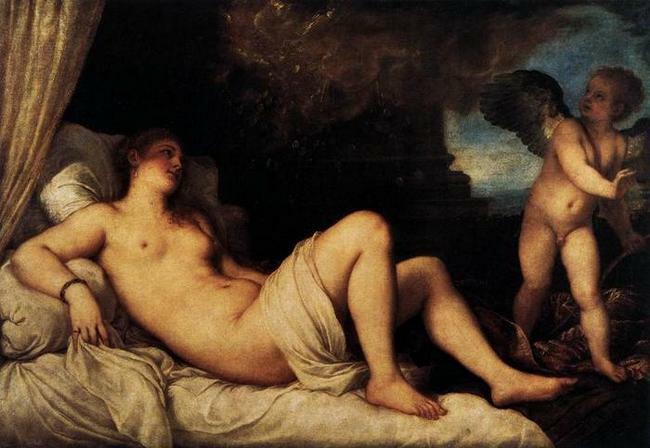 Many paintings by Titian and is written in the Bible stories. The picture is called – “The Flight into Egypt,” it is based on the story of the birth of baby Jesus, when the cruel King Herod ordered to kill all newborn babies, Mary and Joseph fleeing to Egypt. In the center of the painting Virgin Mary rides on a donkey, holding a small Isusika. A young boy at the front leading the donkey – an angel, symbolizing God’s providence and protection of the Mother of God and her divine child. Joseph, Mary’s husband is behind them. And this picture is called “Venus and Adonis” is already written on the popular Greek myth of the goddess of love, Venus and Adonis of a beautiful young boy. Once it so happened that the little Cupid flew to his beloved mother Venus became flippers and accidentally wounded her with his arrows of love. It turned out that Venus herself was a victim of love and passionately in love with a beautiful young hunter named Adonis. I fell in love strongly strongly, until he lost consciousness. Adonis, too, fell in love with the beautiful Venus, but not its only one he loved. Besides Venus Adonis more than anything I loved one thing – hunting. Beautiful Venus was convincing her beloved hunter Adonis, that on that day he did not go on the hunt, and stayed with her, but did not listen to her Adonis. And in vain do not listen, because hunting is a risky business, ironically, on that tragic day, he became the victim of Adonis wild boar which tore it apart. And the grief of Venus, there was no limit. That’s such a sad story. 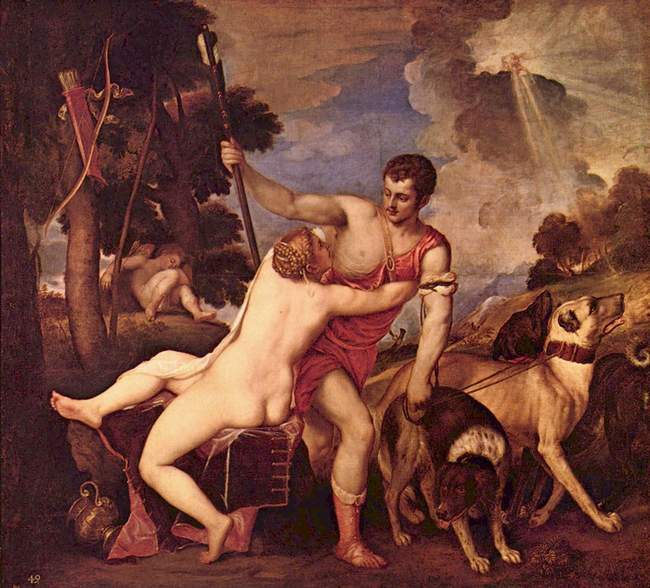 In the picture just shows the moment when Venus Adonis persuaded not to go hunting, but Adonis like a real man, a woman does not listen. (And I even understand it, because hunting, fishing, football, beer – almost holy men). But again an interesting picture of biblical scenes. It’s called “Ecce Homo”. This man – Jesus Christ. The painting shows the suffering of Jesus, after Pontius Pilate commanded whip him with a whip, and then outputs to the public prior to the Jerusalem mob demanding to crucify him. 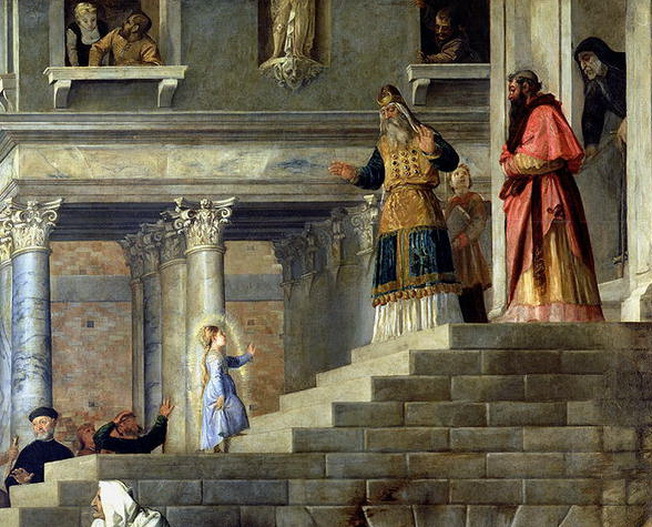 Say painting “Presentation in the Temple” depicts a small Virgin Mary, which is solemnly raised the Temple in Jerusalem by a wide staircase. In Greek mythology, she was the daughter Danae cruel king Acrisius. Acrisius was a prophecy – he will die at the hands of his grandson, so he locked Danae in the dungeon, and no one but the maid did not admit to it. But Danae was a very beautiful woman, so beautiful that even Zeus himself (who was a great lover of beautiful women) wanted to seduce her. Under the guise of golden rain, he gets into the dungeons of Danae and enters it into an intimate relationship. After 9 months, the Danae was born the son of Perseus. Acrisius shocked, because he was not allowed to see his daughter. Orders sharpen Danae and her son in a box and thrown into the sea. But Zeus does not give offense to his son and the beautiful Danae, box successfully swam to shore, and Perseus grows a great hero. But back to the film, “Danae” emerged from under the brush of Titian proved so popular that the artist had to paint her as much as four times. In the first version of the picture next to the winged Cupid Danae depicted as a symbol of love, penetrating even in the dungeons. In subsequent versions of the painting the artist has changed the scenery. Let’s say in this version of the film (in the Hermitage, St. Petersburg) instead of Cupid Danae is a servant with a veil. When I first saw the “Danae” (which, in the Hermitage) for some reason it seemed that the background is a picture of a volcanic eruption. I Thought – Mount Vesuvius, and Danae appears in the image of noble resident of the city of Pompeii, which was completely destroyed in the eruption of Vesuvius. But if you look closely, and you can see Zeus in the form of golden rain, and there is no volcano. Although there are still many Titian paintings of interesting, worthy of attention, this completes the story of this great artist.